It's a feel and a way of storytelling that'll be familiar to fans of Elmore Leonard's work, but it's one that's rarely been successfully translated to the small or large screen. The remarkable thing about Justified is, the creators have managed to tap into that feel. 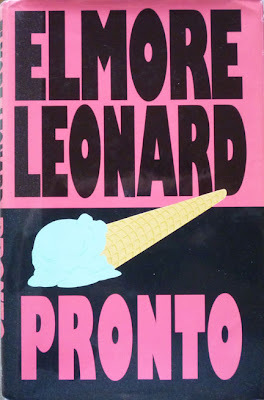 So as well as comparing the events of Pronto to those in Justified, I want to focus in this post on the tone of Leonard's Givens stories, and how the TV show manages to replicate that tone. In the next post, which'll be on the second novel, 1995's Riding the Rap, my plan is to concentrate on the characters – particularly Raylan – and then in the final post, on Fire in the Hole, I'll ponder plot. And in both cases there'll be further reflections on the stories versus the show. We'll see how that all pans out. The description "consummate storyteller" is often bandied about as regards novelists, but it's usually applied as shorthand without ever considering what it actually means. There are plenty of writers who are skillful at imparting a convincing tale, but there are few who really tell you a story. As in, it's almost as if the author is sitting there with you (maybe beside a campfire...), just spinning you a story, right there and then. Elmore Leonard is one of the few. And it's not an intrusive thing either; Leonard is a constant presence when you read his work, but he never gets in the way of the story he's telling. It's the lapping cadence of his prose, the long stretches of dialogue, the low-key verbal jousting, that incredible ear for how people speak, from criminals to normals to lawmen, that make his books so unlike anyone else's. 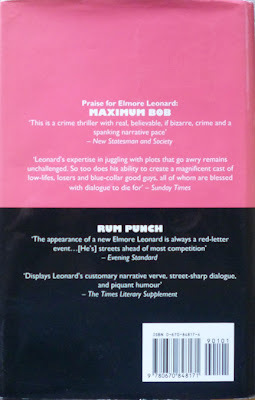 Leonard captivates you and leads you sashaying through his stories like no other writer I can think of. The overall effect is to make his stories seem laidback, easygoing, effortless – even though they're evidently anything but – until, of course, you reach those sequences where violence erupts. Then the underlying tension, that buzzing background menace you always knew was there but had been lulled into ignoring by Leonard's lilting prose and engaging characters, explodes. And the thing is, Justified does exactly the same thing. The TV series has the same easygoing attitude, the same authentic yet witty approach to dialogue – sometimes lifted verbatim from the page – and the same sporadic bursts of violence. Both Pronto and Riding the Rap provide the basic plots for individual episodes in season one of the TV series – as well as a number of other incidents – while Fire in the Hole forms the basis of the debut episode. I'll be looking at that in the final post, but as this post is on Pronto, it's worth outlining the broad strokes of the story and how it fits into the wider Justified arc. 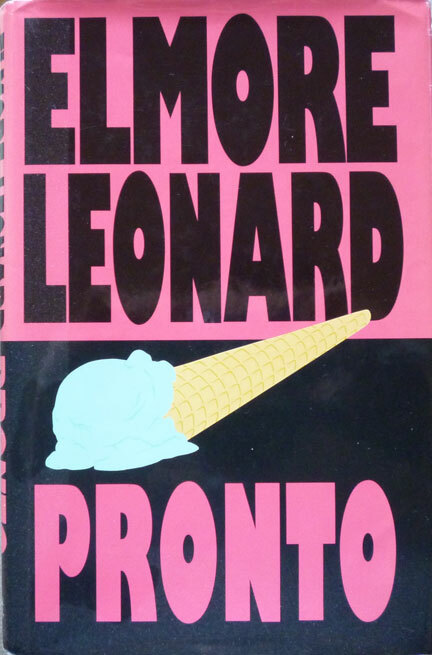 Pronto tells the tale of Miami bookmaker Harry Arno, who falls foul of the mob – from whom he's been skimming for years – and absconds to Rapallo in Italy. He's joined by his girlfriend, Joyce, and hunted by a group of thugs headed up by Tommy Bucks, a.k.a. the Zip. He's also pursued by Deputy Marshal Givens, who wants to bring Harry back to the States. Much of this plot ends up in the season one fourth episode Long in the Tooth. There, Harry becomes dentist and former mob accountant Roland Pike, who years ago embezzled money from his employers. He goes on the run to Mexico, again pursued by the mob and by Raylan. Both Harry and his counterpart Rollie have encountered Raylan before, in both cases when they gave a too-trusting Givens the slip, so there's a history between the characters – almost a friendship – that plays out nicely in the book and the episode. But there are a couple of other notable incidents in the book, one of which occurs in the episode itself, and the other of which opens the entire series of Justified. The first of those is a shootout on a stretch of dirt road between Raylan and two mobsters. 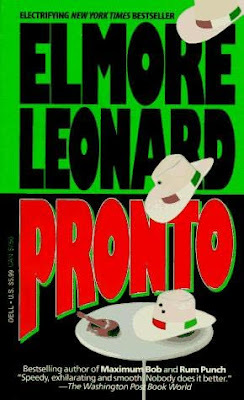 In Pronto it takes place in Italy, while in Long in the Tooth it takes place on the way to Mexico, but a lot of the action and dialogue is identical, right down to the way one of the mobsters tries to get closer to Raylan, telling him "It's okay", while Raylan tells him, "You take one more step, I'll shoot you." The outcome is slightly different, but it's a good example of how scenes are transposed almost wholesale from books to screen. The second incident comes near the end of Pronto, where Raylan confront Tommy Bucks at a Miami restaurant, having given him twenty-four hours to get out of the county. This scene will reverberate through the next couple of books, but it's also how the first episode of Justified, Fire in the Hole, begins. It unfolds pretty much the same way in both cases, and in Justified, as it does in the novels, it haunts Raylan from here on out; not so much in that he dwells on it – Raylan's not much of a dweller, as we'll see in the next post – more that it comes to define him in the eyes of many of the other characters – and in ours, too – and affects his relationships with them and how they respond to him. Incidentally, unlike Harry Arno, Tommy Bucks gets to keep his name in the episode in which he (briefly) appears. But Harry does get a second guest-starring role in Justified, this time as a New York bookie called Arnold Pinter, now reluctantly living in Harlan County and acting as an informant (and still taking bets). His main appearance is in the third episode, Fixer – and that in turn was inspired by the second Givens novel, Riding the Rap, which again co-stars Harry. And I'll be examining that episode and that novel – and also Raylan and one or two other characters – in the next post.